My stint on the Why Why Why Books Podcast has begun and my first episode is up. 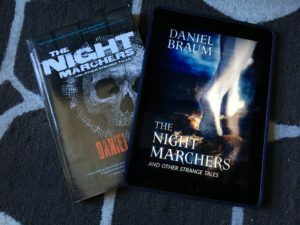 This one’s on The Night Marchers and Other Strange Tales, Daniel Braum‘s first collection of short stories. It helped a lot to do my first episode with both a writer and a reader (Michelle Souliere) who I already knew well. Particularly when Dan and I had to do a bit of re-recording to get good quality audio. Speaking of audio quality, a tip of the hat is due to Tanner Campbell at the Portland Pod, who recommended using Ringr to record interviews. Further episodes are in the works–the next one’s close to editing, and interviews are already scheduled for the one after that, with books by writers from Iraq and Singapore. A young girl watches her older sister go through a coming-of-age ritual in a mysterious and fantastic city. “Sunfast” is set in the same world– same city, even– as both “Moonless” and the novel I’ve been working on for the past couple years.